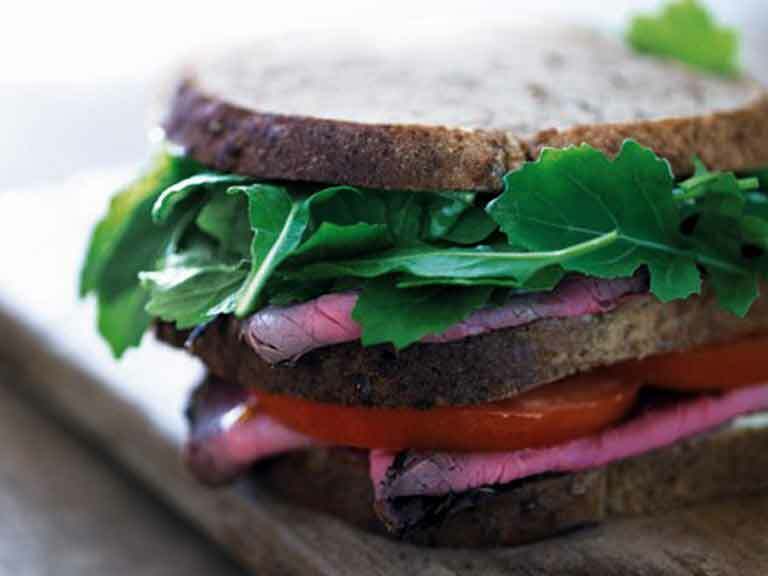 This is the perfect roast beef sandwich - an ideal way to use up leftover roast beef. Rocket is a great partner for fiery horseradish and delicious beef. Roast beef is Sunday lunch classic but can leave a lot of leftovers, especially when there are only two of you. Never fear, however, as leftover roast beef can make a delicious sandwich filling. This sandwich, known as the 'Manwich', makes a fantastic quick lunch. It is made like a club sandwich, with three slices of bread - but if that is too much for your appetite simpy adjust to suit your own requirements. Butter the slices of wholerain bread. Layer like a club sandwich with half of the ingredients starting with bread, then beef, tomato, bread, beef, horseradish, rocket then bread. Repeat with the remaining ingredients for a second sandwich. For further watercress or other baby leaf recipe ideas please visit www.stevesleaves.co.uk.